University High School is making big plans for its campus in Carmel. The private school owns 115 acres south of 116th Street and situated between Shelborne and Towne roads. It currently occupies just a portion of the land, mainly with two buildings and a tennis court. For the past 18 months, the school has been developing a master plan for the campus to envision the best way to utilize the whole property. Now, school leaders are looking for community feedback on a layout that includes about 15 acres of outdoor classroom space, new athletic fields and a building specifically for art classes. The existing Fairbanks building would be expanded. The school is also mulling what to do with about 35 acres that leaders say they’ll never need. Options include selling the property. University High School of Indiana is an independent college preparatory school that opened in 2000. Its student population has grown to about 305 students, and leaders want to make sure there’s adequate space for the school to grow to 400 in the future. 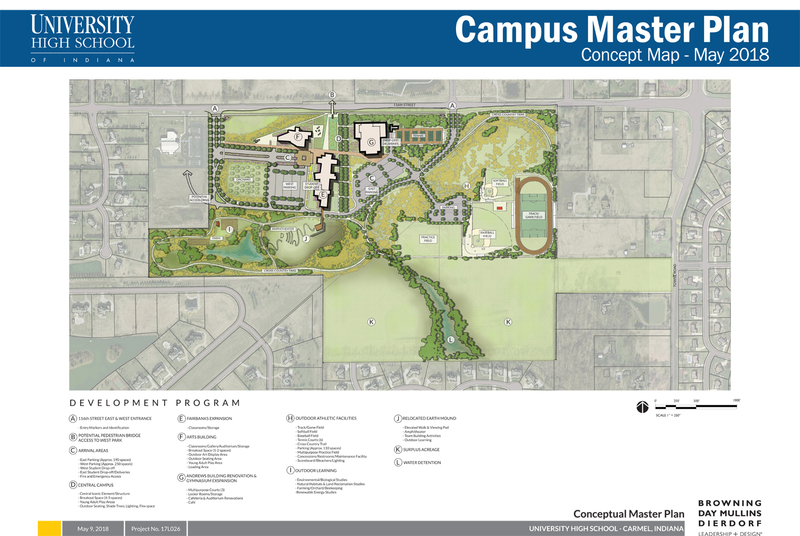 Officials recently held a meeting with parents and students to unveil the master outline, which includes immediate plans to turn roughly 15 acres into an outdoor classroom featuring wetlands, an amphitheater and prairie land. Stacey Summitt-Mann, a science teacher who has been involved in the development plans, told IBJ teachers bring students outside for classroom activities. She wondered what the land was used for before it was a school. Could it be designed to reflect a previous state and provide unique learning opportunities for students? An outdoor classroom would require converting about three acres to wetlands surrounded by about 10 acres of prairie. A small farm and orchard could be planted, and an amphitheater could be built for community events. So far, the school doesn’t have cost estimates for the project. The design phase will get under way soon, and cost estimates could be ready in the fall, Summitt-Mann said. The school’s plans for wetlands and trails align well with the ecological profile of the neighboring West Park, a 120-acre park that includes trails, a fishing pond and prairie, she said. “We want to become a community asset instead of walling ourselves off,” she said. The Indiana Department of Natural Resources and other conservation groups have been supportive of the school’s plans so far, she said. While the school’s first priority is the outdoor classroom, leaders are also considering constructing a new building, which would include a 500-seat auditorium and be utilized for arts-related classes, and adding a softball field, baseball field and track. Those additions would come as funding becomes available, said Head of School Chuck Webster.